The Sea Otter is presented to us by Kathy L. Hans. The Sea Otter is much more than a great iBook. It is a lesson or reminder for all parents and caregivers of the many teaching styles, and what works for kids. Did you ever notice that kids easily can sing their favorite songs, yet struggle with a spelling list at hand? This app combines poetry, rhyme, and rhythm into a fantastic app to help kids remember, and enjoy, the lesson at hand! This poem is written in anapestic tetrameter. We just love it as we remember teaching our kids names, address, and phone number to a song. A jingle that makes it fun just like a poem! Follow along with the tale and fall in love with The Sea Otter! This app is free so grab it and enjoy, then check out the other Kathy L. Hans iBooks! Check out the videos to glimpse this iBook’s features and quality. Zoom and Enjoy, Bookmark, Turn Reading On or Off, Adjust Contrast and More! A gift to us from Kathy L. Hans. Sea Otter Poem And Facts! Check Out The Search Option! Setting Options and “Go To Page”! Zoom In On Sea Otters!! 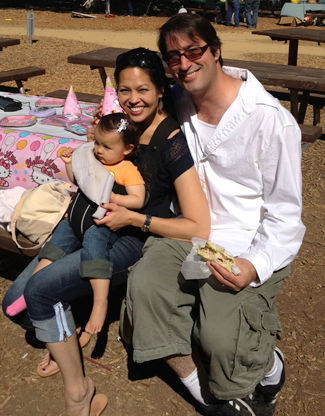 Meet The Hans Family, Pamela – The Graphic Artist, Aaron – The Developer & Kaiya – Future Tester for litteELL.com! 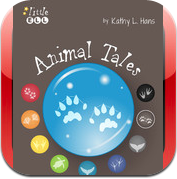 What was your inspiration for the graphic design in the Animal Tales series? I wanted to use an image to represent each of the animals without entirely drawing them and the different shapes of their footprints provided interesting lines. It was important to give character and color to each one while maintaining extreme simplicity and recognizability. The content of these iBooks, which are focused on natural wildlife, is very special and deserves to be accentuated by clean symbols and layout. What’s your favorite aspect of this iBook? The poems are especially enjoyable. 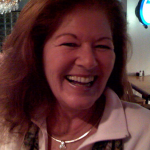 Kathy has made all this interesting content fit into beautiful rhythmic patterns. I like that it is both fun and educational too. I have a one year old daughter and she already likes to have me help her navigate through the program. She isn’t old enough to be trusted not to chew on the iPad if left on her own, but we listen to the program together and she learns about all the different animals while sitting on my lap during reading time.